In the past as well as at present to be born in Gabrovo is next to a privilege. The citizens of Gabrovo are both good at moneysaving and bargaining, for economy runs in their veins; they know how to get something out of nothing - an invaluable lesson taught by their ancestors; upon the very hint of a crisis they set their sense of humour going, for they are left with no other alternative. Numerous anecdotes are told about this shrewd and most careful with money part of the Bulgarian population. It is these anecdotes that created the phenomenon Gabrovo Humour being as viable and vital as ever. …they cut off the tails of their cats so they can close the door quickly and save heat when letting a cat out; hence, the black cat with a cut-off tail has turned into a long-lasting symbol of Gabrovo town. …when something new has only just hit the headlines somewhere, it is already being done in Gabrovo. And hundreds more anecdotes and amusing stories told about Gabrovians by Gabrovians. Small part of them is published in the booklet Gabrovo Anecdotes that has been translated in over 20 languages. It is a kind of an 'envoy extraordinary' of the House of Humour and Satire sent on a mission to open doors, hearts and minds. A selection of this entire wealth of local folk humour is contained in the world-famous booklet GABROVO ANECDOTES translated in 20 languages and published in 43 editions. In 2005 a team of specialists from the Museum HOUSE OF HUMOUR AND SATIRE came up with a new publication of Gabrovo jokes and anecdotes entitled GABROVO HUMOUR. Anecdotes and Jokes about Gabrovians. The collection was compiled by ethnologists Tatyana Tsankova, Research Associate and Venera Kozareva. Artist Yordanka Shiyakova did the design and the illustrations in the booklet. GABROVO HUMOUR. Anecdotes and Jokes about Gabrovians also came out in French, German, Russian and English translated by Darina Marinchevska, Stefka Boeva, Aneliya Tsankova, Veneta Kozareva and Galina Boneva. All editions are available at the souvenir shop of the House of Humour and Satire. The book compilers and translators hope that the fans of Gabrovo humour will take genuine delight in reading the new collecton. 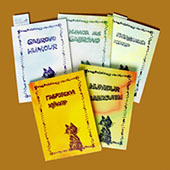 In the summer of 2008 the booklet GABROVO HUMOUR became accessible to all blind people in Bulgaria. Owing to the National Library of the Blind Louis Braille in Sofia and personally to Mr. Spas Karafezov, today the Museum HOUSE OF HUMOUR AND SATIRE possesses a Braille copy of its worldwide famous publication. May this new format - that of relief writing - bring some light and optimism to this group of Bulgarian citizens.